As an academic publishing company A.S.P. / VUBPRESS / UPA offer PhD-students the possibility to publish their PhD thesis professionally, at competitive prices, with an extensive and flexible service, going beyond a mere ‘printing’ assignment. 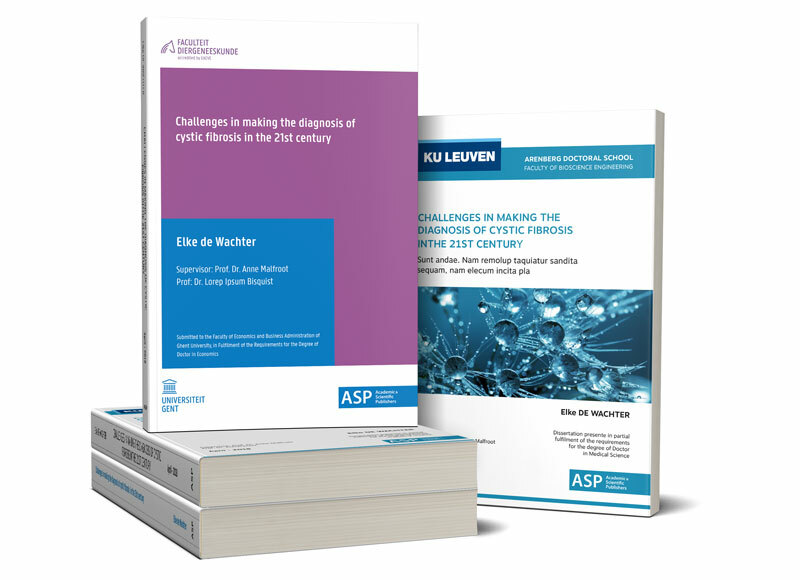 Thesis are published under one of our 3 imprints as desired: VUBPRESS (VUB), UPA (UA) or A.S.P. (KU Leuven, UGent) - we are the official partner of the VUB and UGent.. Use the button in the topright corner to change the imprint. Realising the pressure PhD students face, we offer a fast service of 5 to 6 days between the receipt and finalisation of your PhD thesis. You can calculate your own (non-binding) invoice and – if wanted – save it in your account. Normally if we receive the files on Monday or Tuesday (around noon at the latest), the books can be picked-up the next Monday (in the late afternoon) at our office (34 Boulevard de l’Empereur, 5 minutes away from Brussels Central), or for a small extra fee, they can be delivered that same day. Check the Extras page for our extra services.